Emotions were high at O’Gorman High School Thursday evening after a TV series that focused on racist stereotypes against Indigenous Peoples in Canada was screened for the public. The Timmins Rotary Club and Northeastern Catholic District Board hosted a special screening of “First Contact”, a show produced by Winnipeg-based Animiki See Digital Productions that aired on the Aboriginal Peoples Television Network. The show takes six Canadians, all with strong opinions about Indigenous people, on a unique journey through Canada that challenges their perceptions and prejudices. 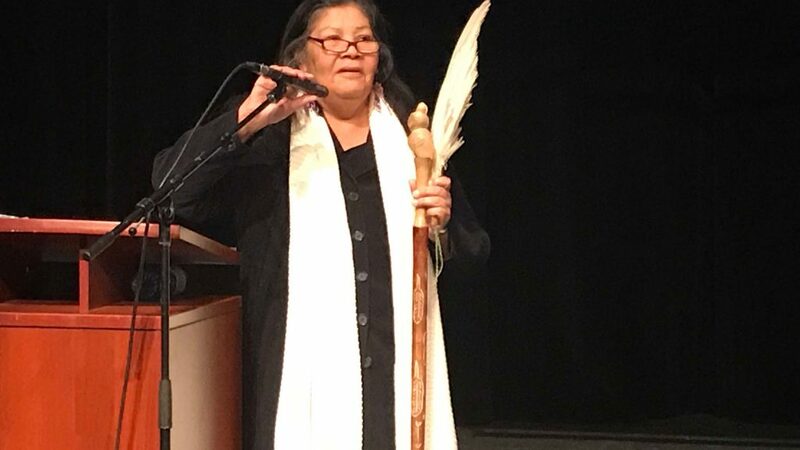 The event started with introductions of a number of special guests administering and taking part in the panel discussion after the screening.There was an opening drum ceremony by the New Moon Sisters and a traditional prayer by Elder Elizabeth Babin of the Wahgoshig First Nation. Mayor George Pirie addressed the crowd with a passionate statement about where Canada as a culture is headed. After the screening, the special panel talked about the misconceptions about Indigenous people and the stereotypes the show addressed. The panel participants were Deputy Grand Chief Walter Naveau of Nishnawbe Aske Nation, Chief Chad Boissoneau of Mattagami First Nation, and Elizabeth Babin. The panelists took turns talking about their personal history, including their painful connections to the Residential Schools and Sixties Scoop. All three panelists spoke of personal trauma, cultural genocide and abuse. The lively discussion turned to the audience and members shared their experiences, both as Indigenous and non-Indigenous people. Hayward spoke to media after the event and she said it’s important to bring events like this screening to Timmins. “I think, because of the location of Timmins, and we have so many communities and Indigenous communities near us, that we have a lot of opportunity to create these friendships and create that reconciliation that was discussed so often tonight,” said Hayward. As an organizer of the event, Hayward said it was everything she hoped for in terms of sparking conversation, storytelling and challenging racial stereotypes. The engagement from the audience shows a real interest in the problems and finding solutions. The Timmins Rotary and HIP (Honoring Indigenous Peoples) have a partnership that has a board made up of 50% Indigenous people and 50% Rotary members. Rotary-HIP has expressed that one of their goals is to work with children and bring awareness about Residential Schools to the classroom. Hayward says there are lots of different opportunities within the club to work within the community, both Indigenous and non-Indigenous. The show, “First Contact”, is available to watch online at the Aboriginal Peoples Television Network.